Raise your hand if you love mason jars! In our opinion, a mason jar is the quintessential country and farmhouse decor piece. We put a simple display together that will make a great gift, or a perfect mantle piece (if you can’t seem to part with it!). When we say simple, we mean simple…you only need FIVE items to complete this keepsake. Decide what you want to put in the mason jar. Little figurines are great! And if you are giving this as a gift, you can find something specific to the person. (e.g. mom, teacher, friend, your boss). We felt loving and our “I Love You Angel” fit the mood. You can even go the route of putting in a photo, or some simple florals! ($9.39) You can also find more resin angel figurines by clicking here. TA-DA! A great piece that is fully customizable to suit your tastes, and/or gift-giving needs! 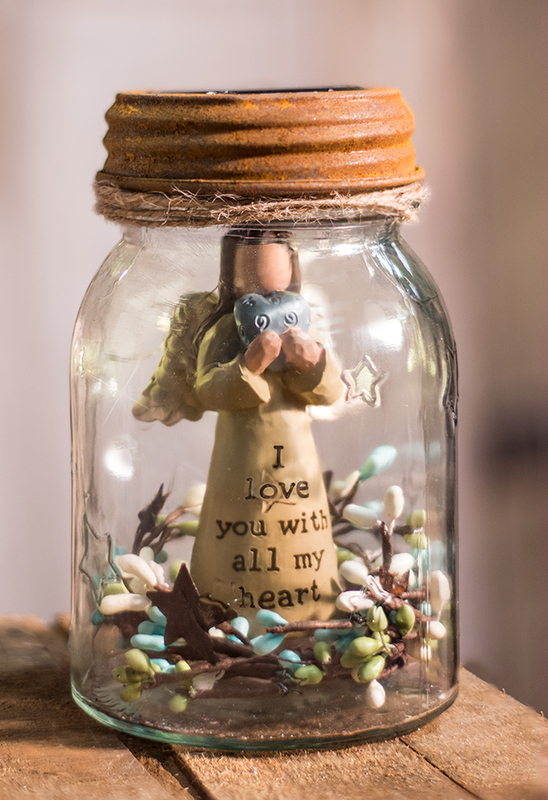 Who would be the lucky recipient of your mason jar keepsake? Thanks Leta! You will have to let me know if you make one!